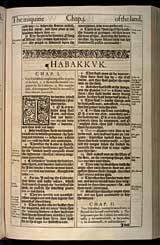 1 The burden which Habakkuk þe Prophet did see. 2 O Lord, howe long shall I crie, and thou wilt not heare! euen cry out vnto thee of violence, and thou wilt not saue? 3 Why doest thou shew me iniquity, & cause me to behold grieuance? for spoiling and violence are before me: & there are that raise vp strife and contention. 4 Therefore the Lawe is slacked, and iudgement doeth neuer goe foorth: for the wicked doeth compasse about the righteous: therfore wrong iudgement proceedeth. 5 ¶ Behold ye among the heathen, and regard, and wonder marueilously: for I wil worke a worke in your daies, which yee will not beleeue, though it be tolde you. 6 For loe, I raise vp the Caldeans, that bitter and hastie nation, which shall march through the breadth of the land, to possesse the dwelling places that are not theirs. 7 They are terrible and dreadfull: their iudgement and their dignity shal proceed of themselues. 8 Their horses also are swifter then the leopards, and are more fierce then the euening wolues: & their horsemen shall spread themselues, and their horsemen shall come from farre, they shall flie as the Eagle that hasteth to eate. 9 They shall come all for violence: their faces shall sup vp as the East winde, and they shall gather the captiuitie as the sand. 10 And they shal scoffe at the Kings, and the Princes shall bee a scorne vnto them: they shall deride euery strong holde, for they shall heape dust & take it. 11 Then shall his minde change, and he shall passe ouer, and offend, imputing this his power vnto his God. 12 ¶ Art thou not from euerlasting, O Lord my God, mine Holy one? we shall not die: O Lord, thou hast ordained them for iudgement, and O mightie God, thou hast established them for correction. 13 Thou art of purer eyes then to beholde euill, and canst not looke on ininquitie: wherefore lookest thou vpon them that deale treacherously, and holdest thy tongue when the wicked deuoureth the man that is more righteous then hee? 14 And makest men as the fishes of the Sea, as the creeping things, that haue no ruler ouer them. 15 They take vp all of them with the angle: they catch them in their net, and gather them in their dragge; therefore they reioyce and are glad. 16 Therefore they sacrifice vnto their net, and burne incense vnto their drag: because by them their portion is fat, and their meat plenteous. 17 Shall they therefore emptie their net, and not spare continually to slay the nations? The subject of this prophecy is the destruction of Judea and Jerusalem for the sins of the people, and the consolation of the faithful under national calamities.The wickedness of the land. The fearful vengeance to be executed. (1-11) These judgments to be inflicted by a nation more wicked than themselves. (12-17)1-11 The servants of the Lord are deeply afflicted by seeing ungodliness and violence prevail; especially among those who profess the truth. No man scrupled doing wrong to his neighbour. We should long to remove to the world where holiness and love reign for ever, and no violence shall be before us. God has good reasons for his long-suffering towards bad men, and the rebukes of good men. The day will come when the cry of sin will be heard against those that do wrong, and the cry of prayer for those that suffer wrong. They were to notice what was going forward among the heathen by the Chaldeans, and to consider themselves a nation to be scourged by them. But most men presume on continued prosperity, or that calamities will not come in their days. They are a bitter and hasty nation, fierce, cruel, and bearing down all before them. They shall overcome all that oppose them. But it is a great offence, and the common offence of proud people, to take glory to themselves. The closing words give a glimpse of comfort. 12-17 However matters may be, yet God is the Lord our God, our Holy One. We are an offending people, he is an offended God, yet we will not entertain hard thoughts of him, or of his service. It is great comfort that, whatever mischief men design, the Lord designs good, and we are sure that his counsel shall stand. Though wickedness may prosper a while, yet God is holy, and does not approve the wickedness. As he cannot do iniquity himself, so he is of purer eyes than to behold it with any approval. By this principle we must abide, though the dispensations of his providence may for a time, in some cases, seem to us not to agree with it. The prophet complains that God's patience was abused; and because sentence against these evil works and workers was not executed speedily, their hearts were the more fully set in them to do evil. Some they take up as with the angle, one by one; others they catch in shoals, as in their net, and gather them in their drag, their enclosing net. They admire their own cleverness and contrivance: there is great proneness in us to take the glory of outward prosperity to ourselves. This is idolizing ourselves, sacrificing to the drag-net because it is our own. God will soon end successful and splendid robberies. Death and judgment shall make men cease to prey on others, and they shall be preyed on themselves. Let us remember, whatever advantages we possess, we must give all the glory to God. Verse3: Habakkuk knew that Jehovah God didnâ€™t cause the wrongdoing he saw but he sincerely wanted to know why He allowed it to happen. To whom much is given, of them will the more be demanded. Sin in Christians is not only worse, but if un-repented of and that one's heart hardened in it; it brings blood guilt of all those whom he was supposed to be a witness of the grace of God; but failed! That was the very reason for the world of the beginning being ultimately destroyed, because of the apostasy and abandoning themselves to sin. Betty...sin is sin...believers forgiven...others not. Are the sins of believers and unbelievers equally offensive to God? "Therefore they sacrifice unto their net, and burn incense unto their drag; because by them their portion is fat, and their meat plenteous." Everything for which the devil slanders God and accuses His People of, he himself is the one doing those things! The children of the devil can only imagine to satisfy their lust for power and authority by slaughter and oppression; and this is their religion!